I am officially a member of the ‘Sandwich Generation’. I still have a teenager at home and I help take care of my octogenarian parents. I’ve learned to roll with the punches. The good news is I’m finally past menopause so I’m no longer living in a “Hormone House”. 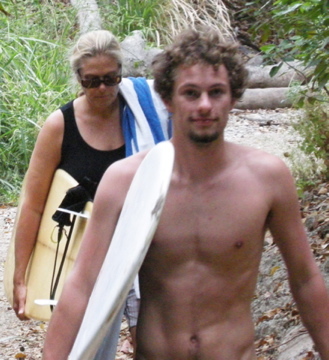 A few years ago, my older son went through puberty with two menopausal Moms—whew! But that’s another story for another time. I suffered a lot of loss at age 50—got laid off my job, my wife left me after 27 years, we sold our beautiful home, my best friend died. Ugh. But I was finally feeling ready to move on with my life. At first I couldn’t believe that I would ever be happy again. But once the ‘why me?’ voices quieted down, I realized that I was free to begin living the life I’d always dreamed of. I was ready to travel! I went to the Dinah in Palm Springs, surfing with my older son in Mexico, visited old friends in Boston, cruised to Rome, Florence, Portofino, Monte Carlo, Barcelona, and St. Tropez, took multiple camping trips and went with Mom to Hawaii. It was all about meeting new friends, reconnecting with old ones and spending time with family. For my birthday, my son and I headed up to the mountains praying for snow—lots of snow. We barely survived the terrifying drive through a whiteout while slipping and sliding over the summit. That night we dreamt of being the first snowboarders at Squaw Valley, drawing clean lines in the untouched powder. We got up early and hurried to dig the truck out only to find that all the resorts had closed—too much snow! Be careful what you wish for. But honestly, being trapped in that cozy cabin with him all day, playing games, reading and watching bad TV was one of the best times we’ve ever had together. I decided that dating for the first time in 30 years might be worth a try. OMG! Come to find out that dating is one of the top reasons people stay in relationships! I fell hard for the first woman I went out with (and it didn’t work out) but she has become one of my dearest friends. I started volunteering for Spectrum, the local LGBT Center in Marin. As a member of the Speaker’s Bureau, I go into the high schools to talk about being a lesbian, break down stereotypes and hopefully save lives. When they wanted me to go into my son’s class I asked him if it was OK with him. He said “Yes, do it; those kids need to hear you”. I’ve learned that giving back to the community has been incredibly satisfying and makes me feel like my life is on the right path. Taking carfuls of teenage boys surfing up and down the California coast has been an adventure. I always have to suppress a giggle, listening to them sing a heartfelt rendition of Tim McGraw’s “I’m Amazed by You” or “In the Still of the Night” while trying to harmonize with their newly changed voices. I choked up when I watched my son drop into his first real shoulder-high open-face wave this past fall. After trying to get him out there for years, it was the peer pressure that finally got to him. He was stoked! In a moment of weakness I allowed an adorable rescue kitten to adopt me. I’d been holding out after my ex got custody of our beloved Ziggy. Even though Clyde does his best to tear apart my house, he is my lover and I’m counting on him to keep me out of trouble with bad dating choices. I made the wise decision to rent a cute little house across from the high school. Every Thursday during the school year I make lunch for a group of amazing boys and girls including my son. They eat everything in their path like locusts, but are always gracious, clear the table and thank me with sincerity. I love those little punks, having coached several of them in soccer and baseball since they were in kindergarten. My life was feeling so full and good with everything coming together at last. Then, suddenly everything changed. First an old surfing buddy my age died unexpectedly. And shortly after being diagnosed with lung cancer, my dad passed away, leaving my mom alone for the first time in 60 years. The worst part about losing my dad was, well, losing my dad. But the best part was that I got to be there to help him through his dying process. I found out that going through the death of my best friend had taught me exactly what I needed to learn just in time to be there for my dad. I was able to tell him I loved him, and thank him for the gifts he gave me—his creativity and blue eyes, for starters. I assured him it was okay to let go and that he would always be with me, in my heart. I feel blessed and honored to have been there with him, by his side—with no regrets about things I wished I’d said or done. But grieving isn’t a linear process, and the other day I found myself in a deep funk, feeling sad and missing my dad. My son said “C’mon, mommy, let’s go surfing.” As usual, the kids made me laugh in the car with their silliness. I forgot about my funk. I remembered all the exciting, wonderful adventures I’d had since turning 50. I realized that the pain of all my losses is equal in measure to how much I have the capacity to feel love. I felt an immense wave of gratitude looking up into that pink and yellow sky at sunset. The iridescent water opened up a perfect drop down a steep, glassy wall and sent me flying across the face on a long, smooth ride to the beach. Posted July 26th, 2012 & filed under Blogs. You are an amazing woman. This article just makes me realize something I already knew, I am so fortunate to have met you. I wish I could articulate as well as you. All these type of thoughts and life experiences get lost in my head. I follow your adventures whenever you post anything. Now, when are you going to take me surfing???!!! such a mix of life, you are living life, “Osa ShalOM” and that is what we are here to do…you do it well robin, and write it well . all of it. the joy the pain the moving thru and on top of it all you have a boy to remind you to keep surfing. together! what a blessing you are and you share.